You know what is uncommon? That I would crave a salad. A specific salad, actually, that I had from 141 South on special, one night in March. Since then, I’ve gone there hoping in the back of my mind that tonight would be the night, and when the cute waitress would read me the specials, that I could dance a happy dance when she read off my spinach salad. But nay, it was not to happen. But it’s just a salad, I know what was in it, I can make this, right? YOU BET I CAN. Now you can too. Here is my recipe. Add mushrooms, balsamic vinegar and basting oil to a bag and marinate for at least 10 minutes. Peel one medium shallot, wrap in foil and bake for 35 minutes at 400 degrees. Cool and mince. Whisk with the remaining dressing ingredients. While the shallot is roasting, grill the mushrooms on each side, on an outdoor grill or using an indoor grill pan. Cool and then slice. Toss the spinach with the dressing. 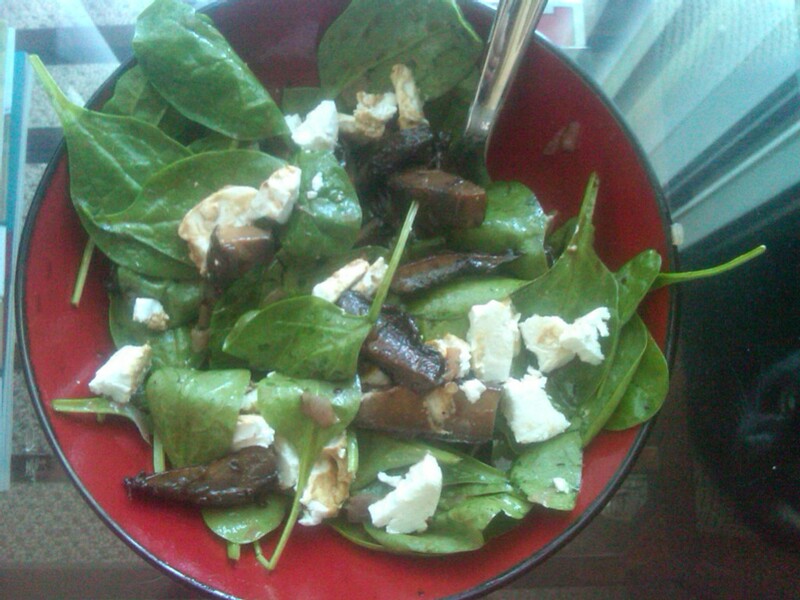 Top with mushroom pieces and slices of goat cheese, serve immediately.